Tens of thousands of Cornish households could be in for a nasty shock this month when they receive their January energy bills. Rising wholesale electricity and gas costs threaten to push the cost of the average duel fuel bill up by as much as 5 per cent, which is £55 on an average bill, according to the Truro based charity Community Energy Plus. The charity estimates that two-thirds of households in Cornwall, about 175,000, are unnecessarily boosting the profits of energy suppliers as they are still on more expensive standard variable energy tariffs which offer almost no protection against price rises and are the most expensive. 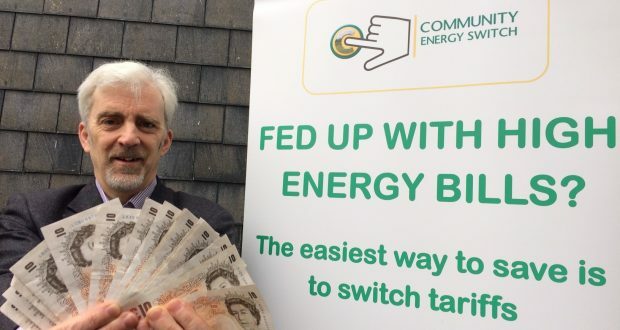 Community Energy Plus is highlighting the extent of Cornwall’s energy bill rip-off in a bid to motivate more households to join their collective energy switching initiative which uses group buying power to negotiate cheaper energy tariffs. Launched two years ago by the charity to help fight fuel poverty by making energy more affordable, Community Energy Switch has helped over 2,000 people to switch energy tariffs. Providing average savings of £230 a year, the initiative has kept almost half a million pounds in the pockets of householders. Cornwall’s collective energy switch links into the group buying power of other collectives taking place across the country at the same time but needs as many people as possible to register their interest in order to secure the winning exclusive cheap tariffs during the energy auction. The winning exclusive tariffs will be available after 13th February, but only to those who have registered their interest before this date. Households can register, with no obligation, online at www.communityenergyswitch.org.uk or by calling the charity on Freephone 0800 954 1956. Community Energy Plus is a local charity which provides free advice and practical help for householders to enjoy warmer, healthier homes. As well as making energy bills more affordable, each tariff switch generates a small commission from the new energy supplier which is helping the charity to continue its work to fight fuel poverty in Cornwall. Community Energy Switch is open to everyone – whether they live in or outside Cornwall. This includes people who own their own homes, rent from a private landlord or social housing provider, as well as if they pay their energy bills by direct debit, cheque, cash or a pre-payment meter. Once the winning tariffs are available, householders will be able to see how much they could save and how it compares to other tariffs on the market to be sure that they’re getting a good deal before they agree to switch. The average annual energy bill in the SWEB region is currently £1091 (source: energyhelpline, 5 Jan 2017). Consumption based on OFGEM average annual usage of 12,500 kWh of gas and 3,100 kWh of electricity and average cost of big 6 standard variable tariffs. OFGEM Retail Energy Markets Report, August 2016 (https://www.ofgem.gov.uk/system/files/docs/2016/08/retail_energy_markets_in_2016.pdf) page 3. Applying the UK calculation of 66% of on variable tariffs equates to 175, 276 homes, based on there being 265,570 homes in Cornwall.